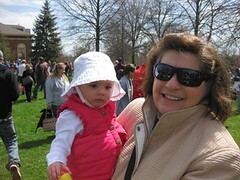 Saturday Sophie, Nini and I walked to Tower Park in Fort Thomas so Sophie could participate in her first egg hunt—she just made the cut-off. 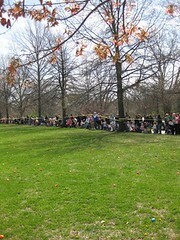 Twelve thousand plastic eggs filled with candy and slips of paper guaranteeing a prize were placed around the park. 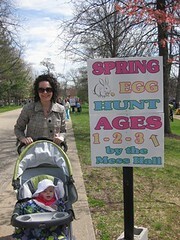 Thankfully there was a 1 to 3 age group so Sophie didn’t have to battle older children for eggs. Children expectantly held onto their baskets, barely able to wait until the “go” siren rang from the nearby firetruck. And some didn’t wait! Every few minutes you’d see a small child make a break for it, clutching her basket, smiling so big at being alone in a field full of plastic eggs for the picking. And then you’d see her harried (but often laughing) dad running after her, camera bobbing around his neck. 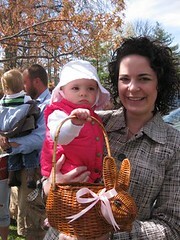 Here’s Sophie, holding her basket. 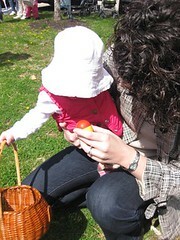 We tried to put her down on the grass, so she could pick up an egg on her own, but she was a little overwhelmed (and to be honest, once the siren rang, I was, too!). 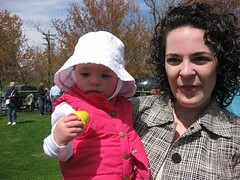 Sophie ended up with two eggs, filled with candy that made a wonderful noise when she shook them, like a homemade rattle. This entry was written by kara, posted on April 13, 2009 at 5:08 pm, filed under Uncategorized. Bookmark the permalink. Follow any comments here with the RSS feed for this post. Post a comment or leave a trackback: Trackback URL.